TPU reports Amazon is taking pre-orders for AMD's FX-8120 with liquid cooling bundle for $383.50. The part-number for this chip+liquid-cooling bundle is "FD8120FRGUWOX". 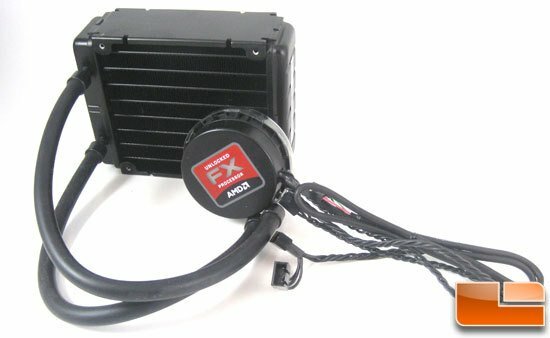 The liquid cooler is originally made by Asetek, combined with the unlocked base clock multiplier of the FX-8120, it facilitates high overclocking. The cooler is not just a dumb closed-loop, but also packs sensors that connect to the system over USB (internal USB 2.0 header), that let you monitor it via Chill Control software. Pros: Very nimble in multithreaded applications. well-dispersed. Disadvantages: consumes lots of energy. hot (water-cooling will be very helpful here). In the games give way to any Intel's quad-core.